Wood, water, steam, electricity, ski resorts, bits and bytes. Those are the various stages in the economic development of mountain regions throughout the centuries. But how can they fit into the current trends of economic development ? A revolution and a challenge. For millennia, the nomadic hunters of the Stone Age roamed the Alps, scavenging the available resources. Hunting for quartz, marmots or ibex, they made their way over the passes and set up high-altitude camps of which there are many relics. Well before the Alps were actually inhabited, the mountains were part of the subsistence economy of the local peoples. A fascinating history spanning 50 000 years to be discovered in an exhibition organised by the museums of Sion, in the Valais (Switzerland). The Alpine Gauls, originating from rather warlike, nomadic populations, enjoyed remarkable economic prosperity for centuries under the rule of a Roman empire undergoing strong growth. With craftsmen, merchants, peasants and large agricultural domains, the Allobroges were the first Alpine civilisation that also placed importance on the arts, earthly as well as intellectual pleasures and the privileges of citizenship. A voyage in time. The first coins in Europe, the thaler, were produced in this silver-mining valley in the Erzgebirge, near what is now the German-Czech border. The name had a future, it became the dollar. Dawn has broken. You instinctively breathe in rhythm with your steps. Slowly, regularly. The slope is steep, the pebbles on the path grind under your feet. Economic globalisation is nothing new. Starting in the 1400s and until the end of the 1800s, peddlers and merchants organised in their particular fashion the flow of money between the high villages and the low-lying areas, spreading their commercial activities as far and wide as Amsterdam and Cadix. Laurence Fontaine studied each minute detail in the ledgers of Jean Giraud, a merchant from a small village in the Oisans mountains. For centuries, Alpine workers hewed gold out of their stone quarries, cutting into the mountains to extract millstones. Highly appreciated for their exceptional quality, the enormous wheels were sold throughout France. They represented a very profitable business that often left spectacular scars. It was magnificent to smell, the oil of lavender that flowed, drop by drop, from the old stills. Extremely refined, the oil from the southern Alps enjoyed its period of glory at the beginning of the 1900s. But lavandin, a more profitable crop that could be grown at lower altitudes finally proved fatal to the lavender market. Did hydroelectric power mark the start of a new economic period in the northern Alps at the outbreak of the 1900s ? During this period of strong growth, what roles were played by local initiatives and external contributions ? What effect did this economic cycle have on the region’s capacity to adapt to later changes ? An inquiry. Around the world, Swissair was recognised as a successful, major airline from a small Alpine country. The turn of the millennium, however, marked the end of the line. From takeoff to crash, the Swiss legend viewed from inside. A dynasty of photographers, the Martinotto, dominated in Grenoble for a century. They turned their lenses to the city, the mountains and their fellow citizens. An exhibition at the Musée dauphinois reveals true works of art, full of perception and sensitivity going far beyond the remarkable commercial success. The « Snow Plan », launched in the 1970s, turned winter tourism in the French Alps around from a rather unorganised local affair into a true ski industry. 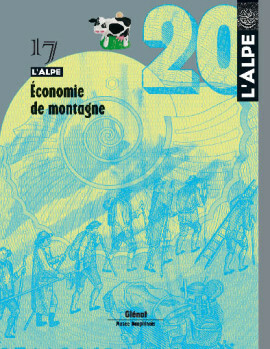 A crash program carried out with purely capitalistic motives in mind and that produced significant « collateral damage » that even today, decades later, still weighs on the economic development of the Alps. From peddlers to ski instructors, the Alpine inhabitants have worked a wide variety of jobs to supplement the meagre living drawn from the land. This centuries-old practice has taken on many forms over the years and in the different areas, but remains an indispensable part of the economic system in mountain regions. Paradoxically for a neutral country, Switzerland was obliged to set up impressive military installations to defend its territory. Mountains, passes and gorges were the site of a gigantic network of fortifications. Now useless, these installations have been deactivated. An example is Saint-Maurice, on the outskirts of the Valais, which is the subject of a handsome book from Éditions Pillet. Here some excerpts of a photographic voyage by Bernard Dubuis to a forgotten citadel. Born of a glacier in the heart of the Alps, the Rhône flows through vineyards right from the very start of its long journey. Vines would seem to appreciate the great river, also a major means of transport and trade. From the Valais mountains to the hills of the Gard, it sets the stage for a wide variety of landscapes, human endeavours and wines that have been renown since Roman times. A book to be published by Éditions Glénat in October takes us on a geographic, historical and Bacchic cruise, from the high-altitude vineyards to the wines drawn from the sandy Mediterranean soil. Excerpts.